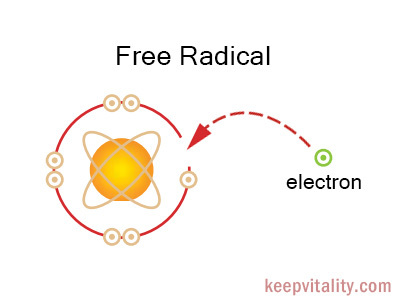 Free radicals are any type of molecules or atoms that are unstable due to an excess or deficient number of electrons, and aggressively seek to steal (or donate) electrons from other molecules or atoms to stabilize themselves. When a free radical attacks a molecule, the molecule loses or recieves an electron making it unstable. It then becomes a free radical itself, beginning a chain reaction. Once started, the process can cascade resulting in damage to cells, proteins and DNA (the body’s genetic code). And such damage may lead to the replication of a damaged cell, which can then become cancerous. Free radicals are generated in our body as byproducts during normal metabolism, or processing of foodstuffs, and while fighting infections, etc. Free radicals are also generated by cigarette smoke, fried foods, ozone, excessive exposure to sun light, environmental pollutants such as car and industrial emission, certain drugs and chemicals, radiation, and infections. We need to constantly breathe air, and inhale oxygen to live. Oxygen is the molecule of life for us aerobic creatures. When oxygen gets into our blood stream and cells, it is delivered to mitochondria, the power plants in our cells that exist in multitudes, hundreds or thousands, in each cell. Oxygen then undergoes chemical reactions with our fuel, the carbohydrate molecules (mostly glucose) derived from the food we ingest and digest, and generate energy molecules such as ATP. ATP is the universal battery molecule that supplies energy for all type of life phenomena on earth. Unfortunately, oxygen not only interact with fuel molecules to generate energy, but it also generate undesirable side products such as free radicals, and also interacts with other molecules in our body and oxidize (i.e. burn) them. 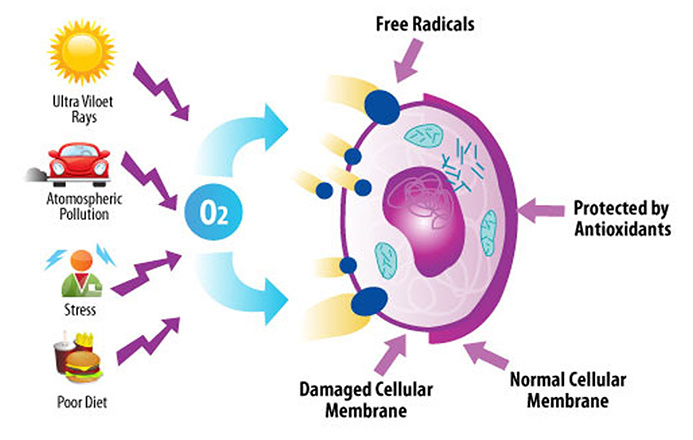 Free radicals are also called Reactive Oxygen Species (ROS) or Reactive Oxygen Intermediates (ROI). In stable atoms and molecules, electrons exist in pairs. In a free radical, however, one of the electron in the pairs is lost. This drives the free radical take a missing electron from other molecules or atoms by colliding, i.e. chemically reacting with them. In the cell, this type of radical reactions caused by free radical causes protein, DNA, and other essential molecules damaged. 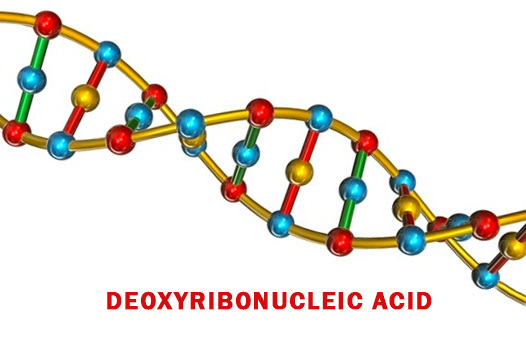 As the molecular damages in proteins and DNA accumulate, the chance for cancer and other diseases increases. The cumulative effect of molecular damages also account for aging – wear and tear of body and deterioration of bodily functions. Some schools of gerontologists say eat less, and avoid harmful environmental exposure. This would reduce the amount of free radicals generated in our body. Research has shown that free radicals can be the cause of many diseases and conditions including heart disease, premature aging, rheumatoid arthritis, multiple sclerosis and Alzheimer’s disease. 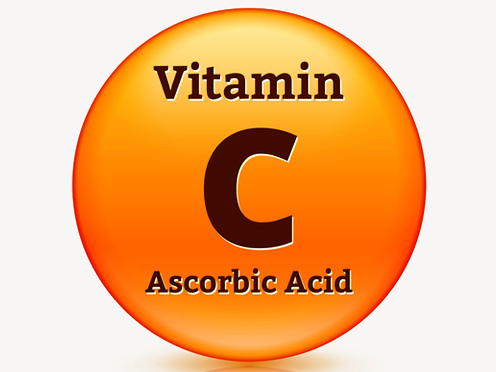 The use of free radical modulators (like Vitamin C, beta carotene, vitamin E) in the prevention and treatment of these diseases is under close investigation at this time including clinical trials. Although free radicals can be very harmful, a small amount can also be helpful in some ways such as fighting off germs, free radicals may act as signalling agents to operate protective pathways. The problem with free radicals is that too many can be harmful if not properly balanced. How to protect ourselves from free radicals? The body itself normally has a protection mechanism called antioxidants in order to prevent free radical damage toward the body. All scientists agree to the fact that antioxidants help. 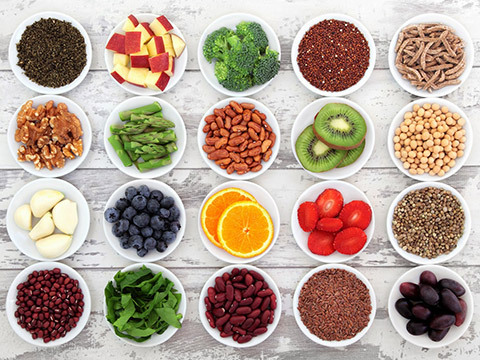 Antioxidants freely offer electrons to the rascals and tame them before they attack our own molecules in our body. We strongly believe we should exploit the botanical resources and mother nature’s recipes that provide us with plentiful of all sorts of antioxidants as well as incredibly diverse health benefitting nutritions. Many of the phytonutrients produced by plant secondary metabolism are excellent antioxidants. Examples are: carotenoids such as lutein, beta-carotene, lycopene, and zeaxanthin; silymarin flavolignans from milk thistle that are liver protectants and strong antioxidants; flavonoids such as apigenin, catechin, genistein, kaempferol, myricetin, quercetin, and rutin; phenolic compounds such as caffeic acid, ellagic acid, ferulic acid, gallic acid, para-amino benzoic acid; triterpenoid saponins such as glycyrrhizin from licorice,diterpenes such as ginkgolide A, ginkgolide B, and ginkgolide C, and sesquiterpene bilobade from Ginkgo biloba; triterpenoid saponins such as ginsenosides (at least 30 different molecular species) from Panax ginseng, etc. 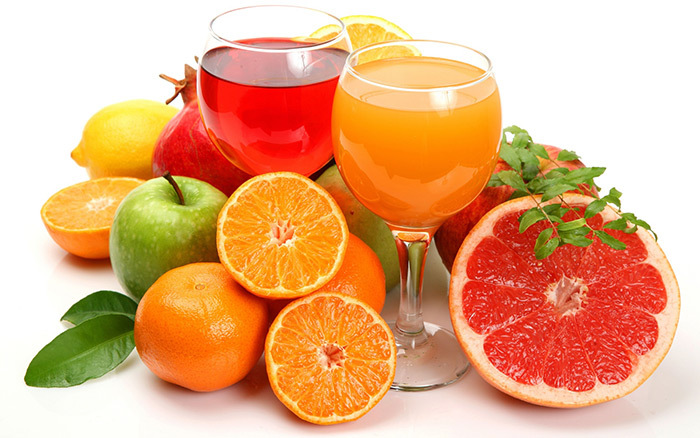 Antioxidant potential of chemicals are usually expressed in TEAC, or Trolox (a water soluble vitamin E derivative) equivalent antioxidant capacity, and measured by the inhibition activity of xanthin oxidase. Dozens of chemical and herbal antioxidant products are available today. black, green and white tea. Strictly speaking, all the fruits and vegetables you eat are rich in plant carotenoids, flavonoids, and other phytochemicals that are excellent antioxidants. Please consume more of these and live healthier and longer. Thank you for a well presented simplification of Free Radicals! I’m currently building a presentation on this topic myself, and this is very helpful! God bless you.